HomeJohn Campbell, 9th Duke of Argyll … Canada’s gay governor general? John Campbell, 9th Duke of Argyll … Canada’s gay governor general? The Marquess of Lorne, 4th Governor General of Canada. John George Edward Henry Douglas Sutherland Campbell, 9th Duke of Argyll KG KT GCMG GCVO VD PC (6 August 1845 – 2 May 1914), usually better known by the courtesy title Marquess of Lorne, by which he was known between 1847 and 1900, was a British nobleman and was the fourth Governor General of Canada from 1878 to 1883. He is now remembered primarily for the place names bestowed on Canadian geography in honour of his wife and for his metrical paraphrase of Psalm 121, “Unto the hills around do I lift up”. He was born in London, the eldest son of George, Marquess of Lorne and the former Lady Elizabeth Sutherland-Leveson-Gower, daughter of the 2nd Duke of Sutherland, and was styled Earl of Campbell from birth. 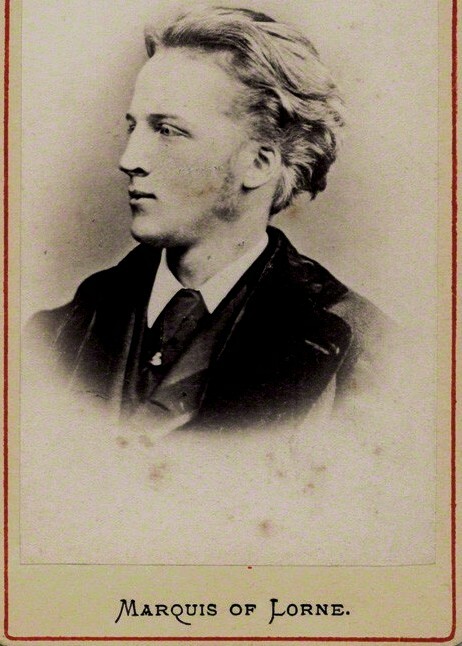 In 1847, when he was 21 months old, his father succeeded as 8th Duke of Argyll and he assumed the courtesy title Marquess of Lorne, which he bore until he was 54. He was educated at Edinburgh Academy, Eton, St Andrews and at Trinity College, Cambridge, as well as at the National Art Training School. 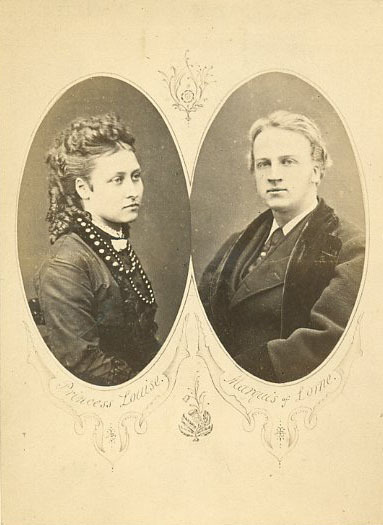 The Marquess of Lorne and Princess Louise. Campbell married Queen Victoria’s fourth daughter, Princess Louise, on 21 March 1871. This was the first time a daughter of the sovereign had married a subject of the Crown since 1515, when Charles Brandon, the first Duke of Suffolk, married Mary Tudor. The pair shared a common love of the arts, but tended to live apart and never had children. Further, Campbell formed close friendships with men who were rumoured to be homosexually inclined, which raised questions about Campbell’s marriage and fuelled rumours around London that Campbell was bisexual, if not largely homosexual in predisposition. When Lord Lorne’s appointment was announced, there was great excitement throughout Canada. For the first time, Rideau Hall would have a royal resident. The Canadian Prime Minister relaxed his busy campaign schedule to prepare for her arrival and to organize a special carriage and corps of guards to protect the Princess. An author wrote in 1880 that “the appointment was hailed with satisfaction in all parts of the Dominion, and the new Governor General entered upon his term of office with the hearts of the people strongly prepossessed [sic] in his favour.” However, Campbell and his wife were initially not received well by the Canadian press, which complained about the imposition of royalty on the country’s hitherto un-regal society, a position that was only exasperated by mishaps and misunderstandings. The worries of a rigid court at the Queen’s Canadian residence turned out to be unfounded: the royal couple were found to be more relaxed than their predecessors, as demonstrated at the many ice skating and tobogganing parties, balls, dinners, and other state occasions hosted by the Marquess and Marchioness. At age 33, Lord Lorne was Canada’s youngest governor general, but he was not too young to handle the marginal demands of his post. He and Princess Louise made many lasting contributions to Canadian society, especially in the arts and sciences. They encouraged the establishment of the Royal Society of Canada, the Royal Canadian Academy of Arts, and the National Gallery of Canada, even selecting some of its first paintings. Campbell was also involved in the completion of the Canadian Pacific Railway and other projects, such as a hospital for British Columbia. In addition to acting as a patron of arts and letters in Canada, Lorne was the author of many books of prose and poetry. His writings show a deep appreciation of Canada’s physical beauty. Throughout his term of office, Lorne was intensely interested in Canada and Canadians. He travelled throughout the country encouraging the establishment of numerous institutions, and met with members of Canada’s First Nations and with other Canadians from all walks of life. At Rideau Hall, he and Princess Louise hosted many social functions, including numerous ice skating and tobogganing parties as well as balls, dinners and state occasions. Princess Louise returned to England in 1881 and Lord Lorne followed two years later in 1883, when his book, Memories of Canada and Scotland, was published. Lorne was Governor and Constable of Windsor Castle from 1892 to 1914 and he sat as MP for Manchester South from 1895 until the death of his father on 24 April 1900, when he succeeded as 9th and 2nd Duke of Argyll. He and Princess Louise lived at Kensington Palace until his death from pneumonia in 1914. According to Princess Louise: Queen Victoria’s Unconvential Daughter, by Jehanne Wake, Loren was not gay. The rumor is persistant mostly because the couple was unable to have children (although there is strong evidence that they tried for many, many years) and the couple was close to Louren’s uncle, Lord Ronnie Gover (his mother’s brother), a gay man, who although innocent, was drawn into a scandal by a gay con artist. So it’s mostly by association and rumors that Princess Louise’s husband was gay. There is no real evidence that he was, and for the sake of history, lets not stop at rumors. Thank you for taking the time to comment. It has been said – with some truth – that history ‘is the tricks the living play on the dead,’ so it is good to have a variety of inputs for clarification. I will make your comments available for others to see. Gerry B. "A shortcoming of histories that concentrate on broad outlines of events is the absence of human faces and stories of ordinary folk that would reveal what animated individuals and families and indicate the experiences they had. Yet only by considering individual human experience can we begin to develop a sense of what these men and women faced and an idea of the magnitude of their achievements.” ~ Stewart Udall, "The Forgotten Founders: Rethinking The History Of The Old West,"
This is a page dedicated to proving that Canada has a history the equal of any its age. Pick a category from Wild West, to modern times, or from medicine to entertainment, and Canada can stand with them all. I have also included a bibliography of interesting Canadian books--books that are both easy to read and informative. However, if you have a book you would like to have included, please send me a note with the title and the author's name. A brief synopsis would be helpful too. I'll be posting updates on a fairly regular basis, so drop by often. --Grass Beyond the Mountains: Discovering the Last Great Cattle Frontier on the North American Continent, by Richmond P. Hobson, Jr.
--Convoys of World War II: Dangerous Missions on the North Atlantic, by Dorothy Pederson.